What do singer Bree Noble, radio announcer Marty Lancer, and resource teacher Ron Freitas have in common? All three are blind. 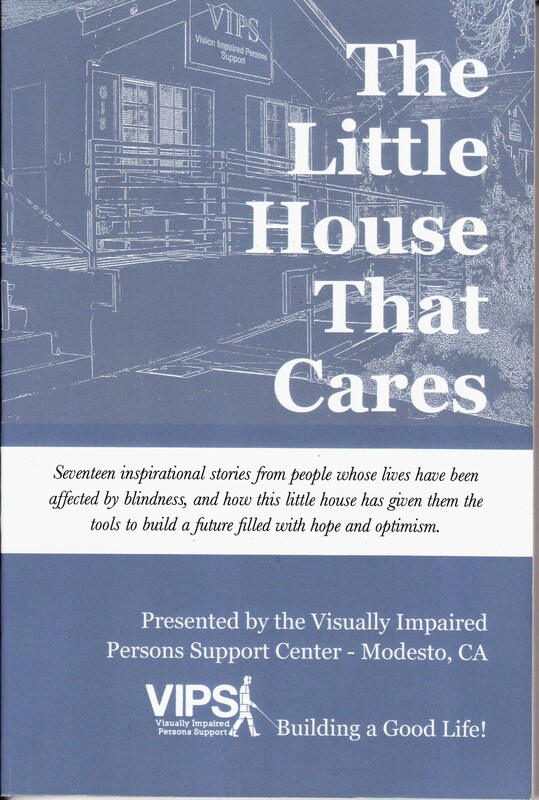 I read their stories, and the stories of fourteen other blind people in “The Little House That Cares”. I was stunned and inspired by their courage and fortitude. They were honest about their struggles and jubilant about their victories. I read that book in humble admiration. I’m always griping about my 20/400 eyesight, and bemoaning the fact that I’m “blind”. 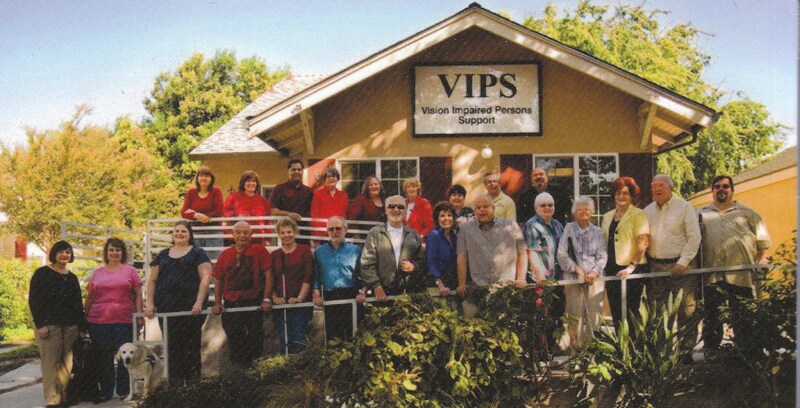 Catchy name – VIPS. I was thinking about my mom one day when I was out for a walk. I was making a mental note to call the Arizona Talking Book Library, and put some books on mom’s list. Suddenly I noticed the cutest little house set back from the street. It had a nicely landscaped yard, wheelchair access, and a big sign on the front near the peaked roof: VIPS: Visually Impaired Persons Support. Right here in my own neighborhood. Then one day my friend, Ruth McKinsey, came to my house and showed me the book she had helped edit for the VIPS. What a surprise! I’ve known Ruth for years, and I knew her daughter was blind. But somehow I had never really put it together, or thought about her possible involvement with VIPS. The main thing I know about Ruth’s daughter, Bree, is that she’s an amazing singer. I eagerly bought a copy of “The Little House That Cares”. Some of the accounts are better written that others, but every one of them had a story that held my interest. I read straight through the book. What would it be like to be completely blind? The question haunted me. How do you suddenly learn to read Braille or walk with a cane if blindness overtakes you quickly, as it did with a couple of the people in the book? I stood up from reading and closed my eyes and tried to walk into the kitchen to get a drink of water. But I couldn’t do it. I immediately got disoriented and nervous. It gave me an idea though. I would buy some of those eye patches and make myself blind for a day – or an afternoon. I really wanted to see what it would be like. 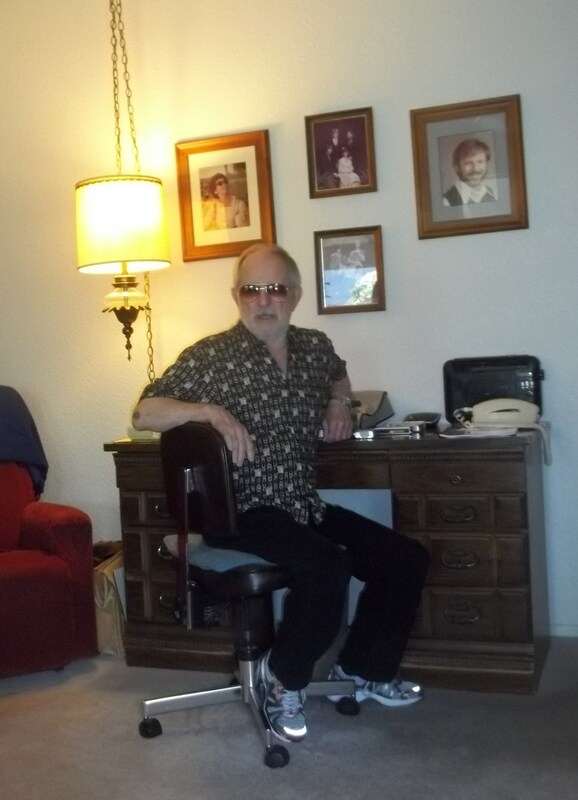 I decided that I’d stop by the VIP house, and see if I could get some tips or ideas from one of the people who had written stories in the book. I told John about my upcoming experiment and he urged me to wait till he was home so he could help me. Most of the people in the book have faithful helpers or caregivers. I was really excited. We went to Wal Mart and got the patches. John’s vacation was coming up. 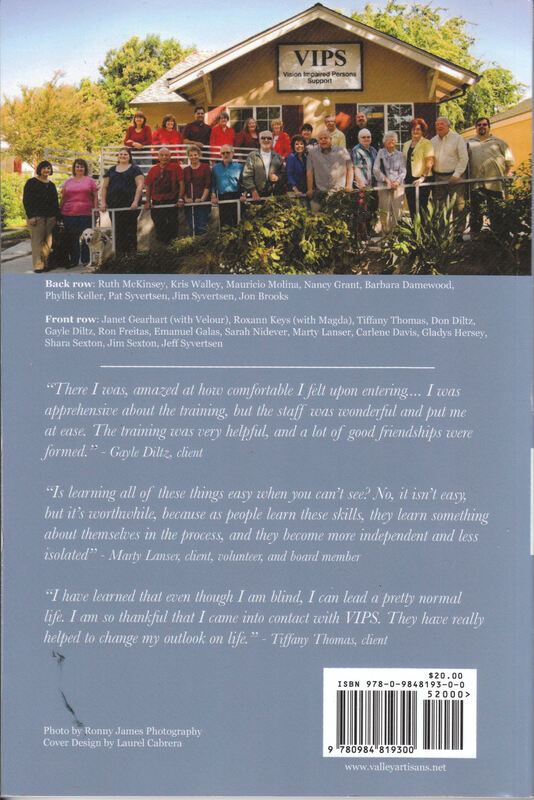 But I still needed to talk to a blind person and get some tips. Ron told me he’s considering a more in-depth book, and he wanted to talk to me about editing and publishing help. I was nearly dancing around the kitchen in excitement. A completely unsolicited offer of just the kind of help I had been wanting! John had been listening to my side of the conversation from his office, and he stuck his head out the door with the most flabbergasted grin on his face. Categories: Book Talk, My Book Shelf, Serendipity | Permalink. It was 1960, a time before the elaborate campers and motor homes we have today, but Steinbeck had an idea. He wrote to the head of a truck manufacturing company and specified his needs. 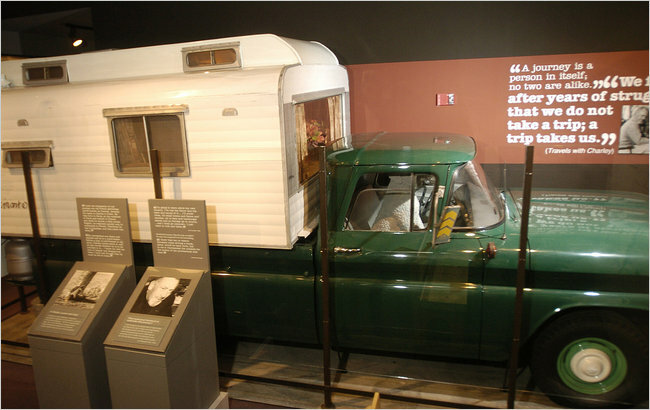 He wanted a sturdy three-quarter-ton pick-up truck with a “little house” built on the back. And in this “rig” he would take to the road, in search of America. On the side of the camper, in sixteenth century Spanish script, Steinbeck painted the name, Rocinante. This was the name of Don Quixote’s horse, which he rode on his great quest. And so John Steinbeck set out on his own great quest. And Charley was indeed the ice-breaker in many conversations with people they met over the next three months, as the exotic dog and his master traveled more than ten thousand miles through thirty-four states. Our family read this book for the first time about 15 years ago, and it gave us the dream of taking our own Rocinante Trip some day. Steinbeck talks about this; the longing he saw on the faces of so many people he met on his journey. So many people with a desire to get up and go. Somewhere. Anywhere. 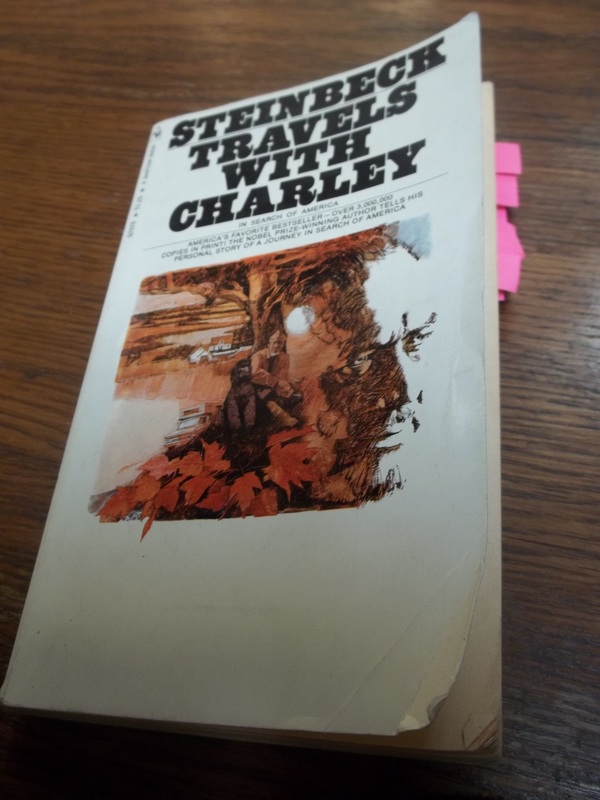 The Paladini Rocinante trip is still being planned, and still far in the future, but in the meantime it has been fun to travel again with Steinbeck and Charley, through the pages of their journey across America. From their home in Long Island they headed north just after Labor Day, traveling through the beautiful New England fall colors. Then, avoiding major freeways, they drove across the northern states towards Oregon, and turned south to follow the coast down to Salinas, where Steinbeck grew up. 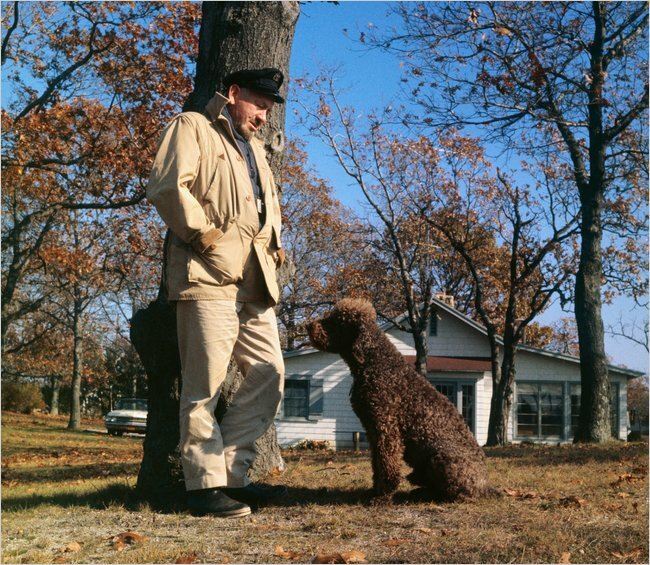 John and I listened to the audio book recently, and John said he felt sad when finally, leaving California, Steinbeck turned east and headed homeward across the southern states. My husband had been so involved with the story that he personally felt the journey was coming to a close. It would be hard for me to say what part of the book was my favourite. The last time I read it I put at least twenty pink stickies on pages to mark passages I like. But there were even more than that. The book is filled with really lovely stories about the people Steinbeck met along the way, and although not all of the people were lovely, every story has a point. But not only does Steinbeck share personal experiences related to the people he met, but the book is full of thought-provoking essays about intangible things, both serious and funny. There’s also a wonderful monologue – I guess it was actually a dialogue since he was probably having a discussion with Charley. He took some pages wondering about what people think about when they drive? I’ve never really thought about what I think about when I drive. But it made me think. He talks about immigration, taxes, labor unions, politics, and law-enforcement. To name a few. In the South he meets head on, the issue of civil rights; which was red hot when this book was written. But whether his comments were dated or timeless, the book itself is timeless and classic. 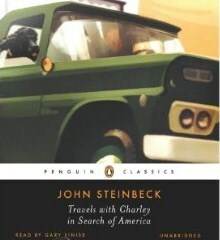 Steinbeck went “in search of America” and he captured it! Categories: Book Talk, My Book Shelf | Tags: Cross Country, French Poodle, John Steinbeck, Rocinante, Standard Poodle, Travel | Permalink. It was the summer of 1945. Cashing in soda bottles, and saving every nickel they could get their hands on, Marjorie and Marty scraped together $40 for their round-trip train fare toNew York City. They were leaving Iowa, in search of a summer job and adventure! 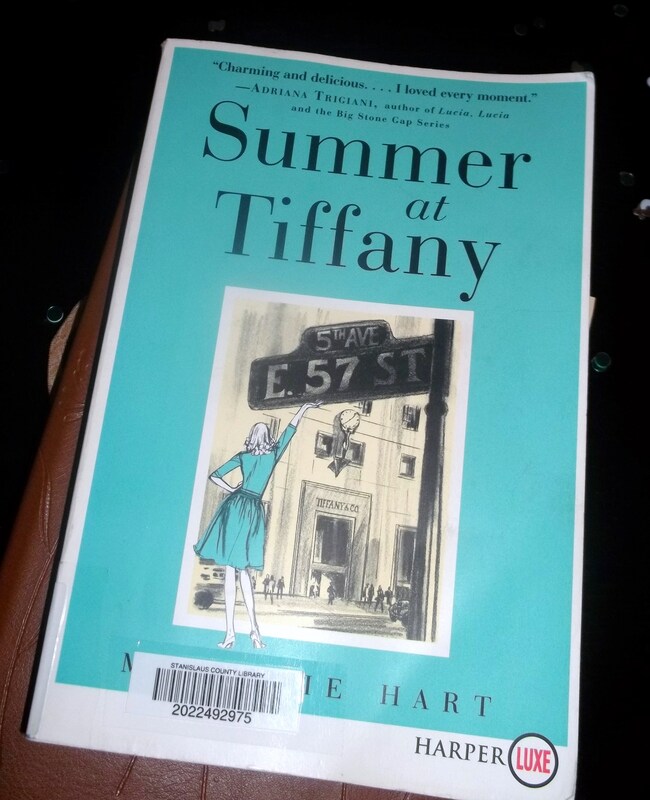 Summer at Tiffany by Marjorie Hart was Michelle’s choice for the June book club read. In the past I’ve talked about our Ladies’ Literary League (Lalas). This month was our 17th anniversary. Over those years members have come and gone, but a couple of us have been in the group the whole time. 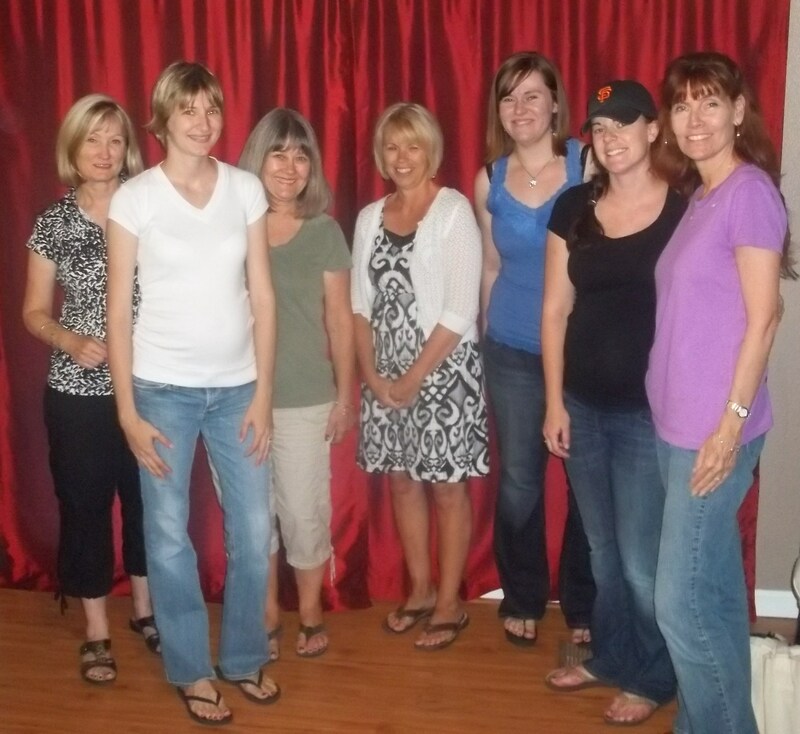 Recently, to our delight, some of our daughters and daughters-in-law have joined us. The little girls who watched their mommies head off to book group are now reading mommies themselves. It’s been interesting to see the difference in taste between our two generations. The older women didn’t appreciate The Maze and the younger women were bored with Sea Glass. We all pretty much enjoyed Hunger Games, but the daughters liked it more than the moms. With those lines drawn, I was happily surprised when Summer at Tiffany got enthusiastic thumbs up from everyone. “I just love that time of history,” Michelle gushed, prompting a discussion about how individual and national values have changed in the last half century. 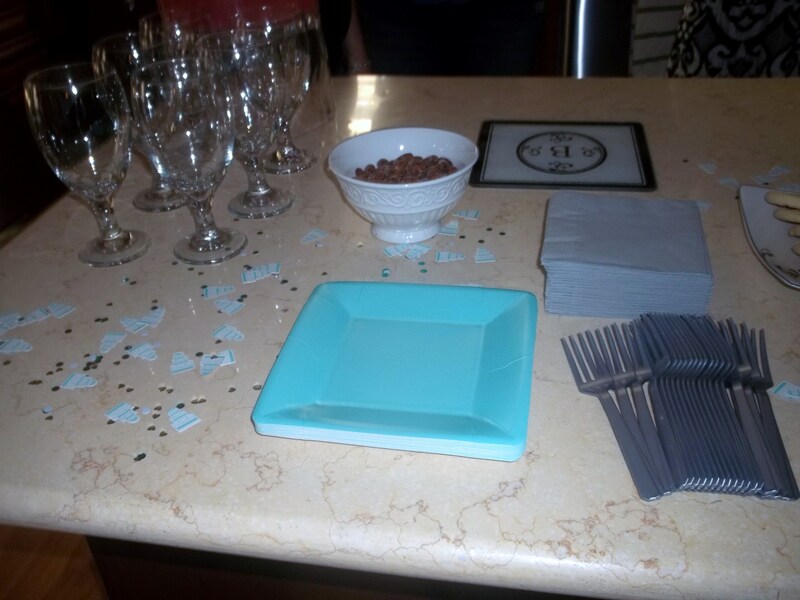 We were meeting at Michelle’s house, and she had decorated with Tiffany boxes and teal plates. She had sprinkled wedding confetti all over the counter, and strings of pearls decorated the coffee table. 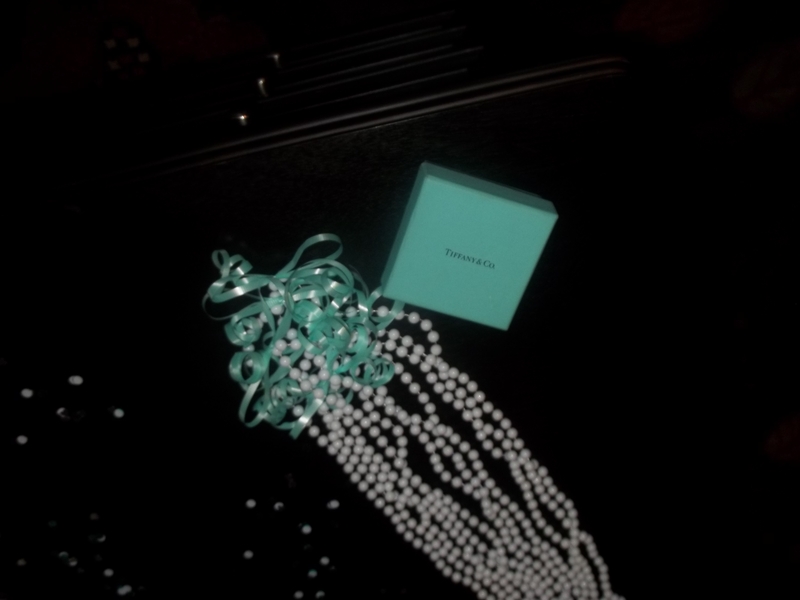 The pearls were our keepsake gift from the meeting, but, she told us, unfortunately they were not real. Summer at Tiffany is a straightforward memoir. In simple, girlish language – “omygosh!” “HolyToledo!” – Marjorie Hart reminisces about that eventful summer. Some parts made us laugh so hard. She talks about the frustration and disappointment of searching for a job, and hoping against hope that they would be able to find an affordable place to live. She talks about the thrill of being the first girls ever hired to work the floor at Tiffany’s; and the excitement of waiting on very famous customers who came in to buy china and jewelry. She tells about the morning an airplane crashed into the Empire State Building, something none of us even knew about. The nation was at war. She writes about the moral quandary she experienced, knowing that so many Americans were making sacrifices for “the war effort” while she had opportunities to go “out on the town.” She writes about falling in love with a handsome sailor, and the heartbreak of losing loved ones killed in battle. One of the most exciting parts was the partying and pandemonium of Times Square on the day the war ended. The book didn’t require very much of the reader. It was like a lovely, slightly thought-provoking, walk in the park. It has some wonderful drawings and pictures of New York scenes and memorabilia. We all cracked up at the picture of Marjorie’s W2 from her summer of work at Tiffany & Co. She earned $220.00 and paid $24 in federal income tax. My only complaint was that the author sometimes brought new people into the story, or referred to events that had no background. It kind of left the reader hanging briefly, but as the story picked up again nothing was lost. I was impressed that an eighty-three old woman could remember so many details and pull them together so charmingly. Definitely thumbs up all the way! Categories: Book Talk, My Book Shelf | Permalink. No, the book is not an argument against marriage, at least not in the way we first think of it. It’s a sort of fantasy/theology novel which underscores the insurmountable division between good and evil. 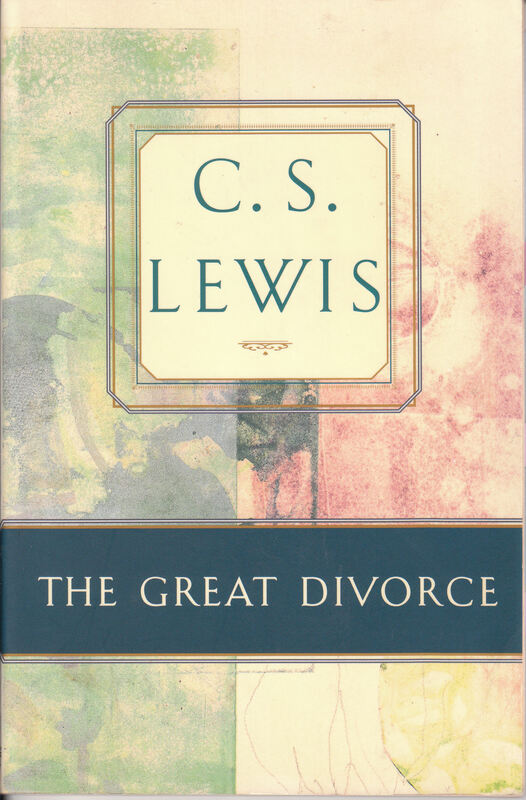 In his preface Lewis explains that his goal is to counter William Blake’s concept of “The Marriage of Heaven and Hell” – to refute the idea that somehow good and evil, or right and wrong can be brought together; that eventually, with enough skill and patience, evil will be turned to good. Evil is evil and good is good. They are opposites. They are forever going in two different directions – divorced from one another. This is a lot to consider in a culture where it’s rude – almost criminal – to say that there is actually a standard of right or wrong behavior. He wanders around observing and listening as the bright solid residents of Heaven meet with ghostlike friends and relatives from Hell. They have serious and loving conversations, but although most of the people from the grey town are fairly ambivalent about it, for one reason or another they reject the offer of Heaven and choose to go back down to what they know. Lewis is not saying there will actually be an opportunity for people to change their minds and leave Hell after they die. The story is an illustration of choices made, seen through the lens of eternity. I’ve probably read this book six times, and every time I read it I come away with some new gem of understanding. It leaves me feeling stronger and richer, and closer to God. This morning was no exception. I closed the book and sat there in bemused awe. My very world and future and all of its prospects seemed larger and more full of promise. Categories: My Book Shelf | Permalink.